Text Pigeon : Have you ever wanted to text someone at a later time? But it might not be convenient or you might forget about it later. Let Text Pigeon! schedule it for you now. Just enter the phone number, message, and the time to send it. Note Text Pigeon! uses the text messaging service (a.k.a. SMS) on your phone. Standard text messaging rates apply. Enter the phone number or scroll through your contacts to select a number. 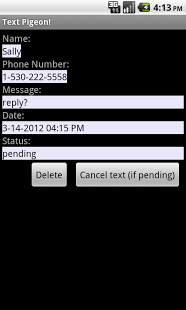 You can review the status of scheduled texts. You may cancel any pending texts. You may delete log entries to save the storage space. TextPigeon! displays a status bar notification, when a scheduled text is sent. Clicking the notification will start TextPigeon! TextPigeon! has a small footprint and requires only minimum user permissions. You don’t need to register to use Text Pigeon !